Will there be civil war or civil unrest in France? While this may seem far fetched to many, it was something that was covered in my book 2012 and the Rise of the Secret Sect. 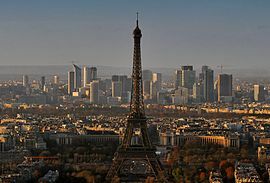 In July 2010, it was reported that France Declares War Against Al-Qaida. France also upset many Muslims related to its position on burqas (see LCG: France Burqa Ban Just Received Cabinet Approval). France is taking a stand against those it does not want. Now France is apparently taking the steps it has related to Al-Qaeda, burqas, and Romanian gypsies for reasons of safety, economics, and culture. But its positions often incite opposition. It may be that enough opposition will rise up and cause civil unrest and possibly civil war in France. France is facing some opposition from the European Union itself for some of its measures. Certain Roman Catholics teach something called “the minor chastisement” is coming. It is supposed to essentially be major civil unrest/civil wars in Europe. And while that has not clearly happened yet, there were riots in Paris, France in the summer of 2005. If civil war/riots/civil unrest do occur in Europe on a large scale, this likely will set the stage for the rising up of a military leader to resolve this. Catholic prophecies specifically suggest that this will happen and they tend to refer to this leader as the “Great Monarch” (or the “Great King”). This “Great Monarch”, however, seems to have a lot in common with the prophesied final King of the North and Beast from the Bible. So, if there is major civil unrest across Europe, and likely including France, this would seem to indicate that this leader will rise up fairly soon. Austerity measures in Europe may also cause civil unrest. Furthermore, it may partially because of civil war/unrest/riots that a de-Islamization of Europe will take place. The situation in Europe will change and the leader known biblically as the ten-horned Beast or the final King of the North will rise up, irrespective of the accuracy of any other predictions. Interestingly, at least one German economist has suggested that civil war may soon come to Greece (Civil War in Greece?). Times are changing. This entry was posted on Sunday, September 12th, 2010 at 5:11 pm	and is filed under Prophecy. France arrests 19 suspected Islamic terrorists: What’s next?